A knee heater for motorcycles, an educational kit that breathes life into drawings, a cotton sanitary pad cleaner, a water-based brush for cat grooming, and a self-drying shoe rack. The lobby of the KAIST Industrial Design Building was filled with 29 design products for everyday life. Students majoring in industrial design held a graduate exhibition under the theme of Redefine Everyday Living from November 10 to 17. The graduate exhibition of the Department of Industrial Design has been held under different themes since 1968. The students participate in every stage of the process, from designing exhibition posters to publishing pamphlets. 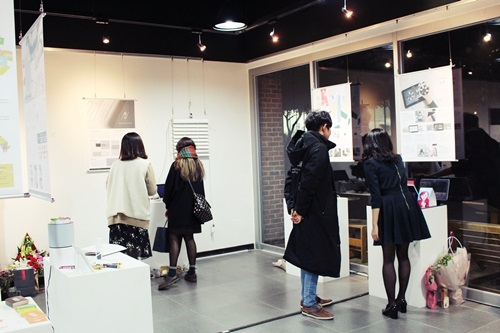 The students also showcased their work on December 7 in COEX, Seoul. Jaeho Sung, the chair of the Graduate Exhibition Committee, and Professor Daniel Saakes shared with us some stories from behind the scenes. 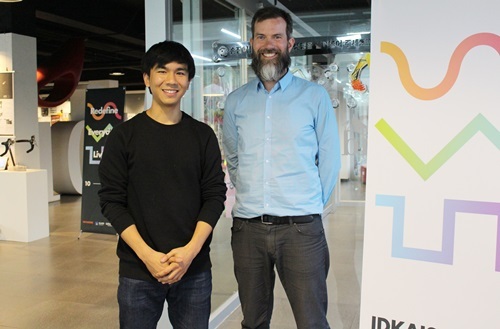 (From left) Jaeho Sung and Professor Daniel Saakes , Department on Industrial Design. (From left) Shadow Puppet Book and B-HEAT. In the middle of the exhibition hall was B-HEAT, a self-generating hot air fan for motorcycles in winter. B-HEAT recycles exhausted engine heat produced at high speed, and uses the stored electricity to deliver heat to motorcyclists. On the other side of the hall, a few shadows danced over a black cloth. This project was titled Shadow Puppet Book. The interactive storybook produces moving shadows when detachable character puppets are recognized in a smartphone application. This was made possible by integrating the puppets with AR markers. 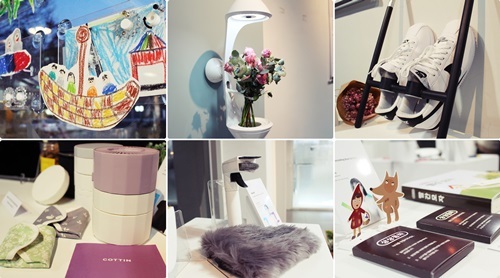 (Clockwise from left) Window Factory (moving drawing kit), Flovie (flower bouquet shelf), Tilt (shoe rack), Sangsang Donghwa (audio recording story book), Na-bit (comb for cats), COTTIN (cotton sanitary pad cleaner). The students decided on their design concepts in spring, and created prototypes in fall. They were each assisted by their advisor and Professor Daniel Saakes. Professor Saakes stressed the importance of presentations and posters, reminding students to put themselves in the shoes of viewers. He taught students how to give an elevator pitch, that is, introducing their work using a few sentences within one minute. Students were advised to step back and think of the big picture when making posters. After getting tips from professors, it was up to the students to make the final decisions. The students’ projects were evaluated on November 14. They gave a presentation for two minutes in English before a group of ten professors. The exhibition was open to parents, friends, professors outside of industrial design, and students. The students had the opportunity to receive feedback from various perspectives. Students introduce their work to visitors.